I miss season 5. Having 50v50 for the entire season was great now we have horrible respawn modes. While this wasn’t one of the best seasons I still prefer it over the god awful season 6. Long live 50v50! Jesus I forgot how much this season sucked. Pls give us a longer version of the music I need this in my life. Who agrees Season 5 had the best Progressive Outfits? This was my first Battle Pass! Nice did you max it? Someone watching during Season 8? - Wächman- What the f* are you saying????????? WHO ELSE AGREES THAT THIS WAS THE BEST SEASON OF FORTNITE? I do, most fun I've ever had playing this game. I started playing Fortnite near the end of this season. My first skin was Summit Striker. Nah bruh you’re the stupid one, I started playing mid season 3 and my first skin was Drift, I didn’t spend money as soon as I bought the game. Anyone Else Getting All The Previous Season Trailers On Their Recommended List Of Videos Everytime They Open Up MReporter??? yeah I thought it was just me. Soon there will be boats! I don’t it’s a guess. How do you know that "real information"
My least favorite season in my opinion. 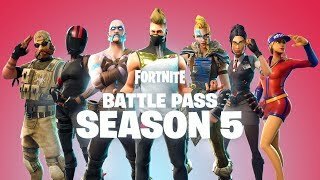 Am I the only one who thinks this Battle Pass was great?? How about season 3 1 year anniversary?